26 MMS December 2017 mmsonline.com RAPID TRAVERSE Machining Technology in Brief impact on the abilit y to produce fe ature s of this type. Several factors must be considered to develop a process to machine par ts this small. As Mr. Smoody explains here, three of these are the operator, the machine and the cutting tools: Operator. Not every operator is made for this type of work. 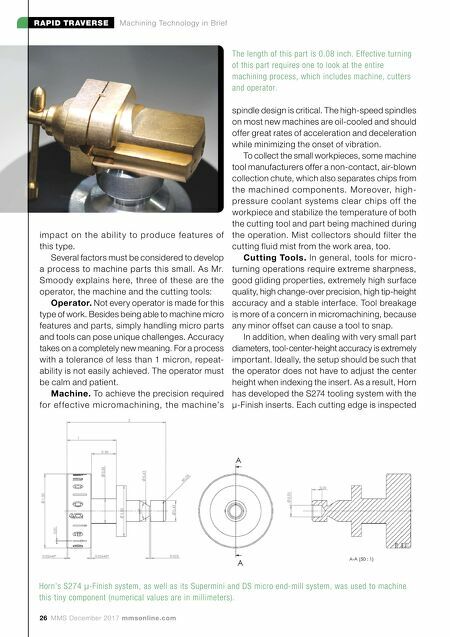 Besides being able to machine micro features and parts, simply handling micro parts and tools can pose unique challenges. Accuracy takes on a completely new meaning. For a process with a tolerance of less than 1 micron, repeat- ability is not easily achieved. The operator must be calm and patient. Machine. To achieve the precision required for ef fe ctive micromachining, the machine's spindle design is critical. 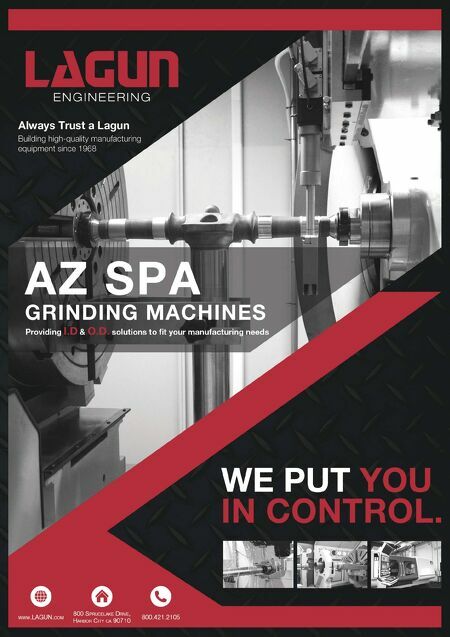 The high-speed spindles on most new machines are oil-cooled and should offer great rates of acceleration and deceleration while minimizing the onset of vibration. To collect the small workpieces, some machine tool manufacturers offer a non-contact, air-blown collection chute, which also separates chips from the machined components. Moreover, high- pressure coolant systems clear chips of f the workpiece and stabilize the temperature of both the cutting tool and part being machined during the operation. Mist collectors should filter the cutting fluid mist from the work area, too. Cutting Tools. In general, tools for micro- turning operations require extreme sharpness, good gliding properties, extremely high surface quality, high change-over precision, high tip-height accuracy and a stable interface. Tool breakage is more of a concern in micromachining, because any minor offset can cause a tool to snap. In addition, when dealing with very small part diameters, tool-center-height accuracy is extremely important. Ideally, the setup should be such that the operator does not have to adjust the center height when indexing the insert. As a result, Horn has developed the S274 tooling system with the μ-Finish inserts. Each cutting edge is inspected The length of this part is 0.08 inch. Effective turning of this part requires one to look at the entire machining process, which includes machine, cutters and operator. Horn's S274 μ-Finish system, as well as its Supermini and DS micro end-mill system, was used to machine this tiny component (numerical values are in millimeters).